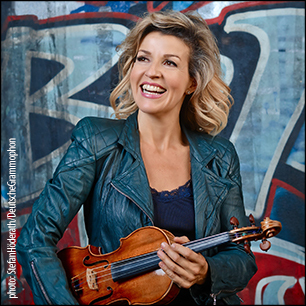 “Anne-Sophie Mutter is coming to Edinburgh’”. “Great.” “She’s playing the Penderecki Metamorphosen.” “Ah”. Actually, I would turn up to hear Anne-Sophie Mutter (ASM) play a sailor’s jig as she would make something of it, but the Penderecki, although dedicated to her by “Poland’s greatest living composer” is a bit of a programming wild card. My fault, I suppose. 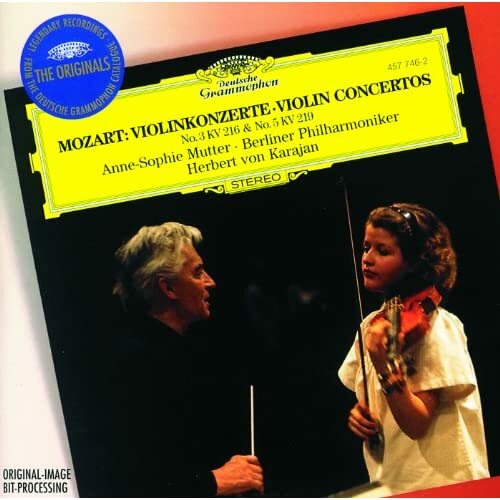 There are certain artists one associates with one’s past and I still have in my head the picture of a rather serious child next to her protégé, Herbert Von Karajan, on the cover of the Deutsche Grammophon 1978 début recording of Mozart Violin Concertos 3 and 5. But of course, that is just memory. Mutter has pioneered modern composers as her career has developed and is a thoroughly accomplished portrayer of classical music spanning 250 years. Many modern composers have written for her and she is the dedicatee of the Metamorphosen. Moreover, Penderecki himself was down to conduct tonight’s concert, but had to withdraw for personal reasons. Given that he is 85 years old this is totally allowable. RSNO music Director Thomas Sondergard took over the reins and did very well as I doubt he had the work in his repertoire. Krzysztof Penderecki is an interesting contemporary composer on a level with – although a tad less accessible – his much more commercial compatriot Gorecki; but behind, say, Lutoslawski. His music is certainly worth a listen, and his second violin concerto Metamorphosen is overall a worthwhile work although structurally weak in parts. But of course ASM made it sound like a masterpiece, a true négociant-éleveur but of music rather than wine. Ten years ago she corrected a mistaken report of her retirement in the French press in saying that she would continue to play as long as she felt she could “bring anything new, anything important, anything different to music”, which is precisely what she did tonight. So often a hyped-up artist can let you down, under rehearsed, on the night. Not ASM, she always delivers, a lesson to artists everywhere. Let me try and unpack what was so special about her playing. First, she found the hidden melodies in this rather spiky piece and made the most of them. Second, the work flowed rather than jerked, as much modern music tends to. Third, I never lost my concentration or involvement in a work that was almost three quarters of an hour long without a break. Last week I wrote how, unfortunately, indifferent interpretation had got in the way of good music (SCO/Mendelssohn, Beethoven,Schumann 22/11/18) but for this concert the reverse was true, a rarely experienced, incredibly high, standard of musicianship. “How do you follow a work of such tragedy and sadness”? ASM said as she introduced her encore. “Bach is always the answer” and rattled off a perfect Partita at breakneck speed that left us gasping. As a writer who is given to enthusiasm but not hyperbole, I have to say that in that 50 minutes I experienced the most intensely satisfying playing of live music this year, if not this decade. Tchaikovsky’s 5th symphony was an extraordinary pairing to complete the concert but at least gave the punters a tune to take home for their money. The commitment of the RSNO to the music was such that we soon forgot the ‘Wow’ factor of the first half and were firmly rooting for the band. It was as if the music had been written for them. Wonderful, sonorous strings, enthusiastic brass; the whole orchestral gamut in fact. Inspirational, seamless, joyous playing. 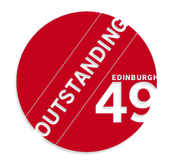 Go to Edinburgh49‘s Usher Hall archive.